Artikelen van Hackaday.com en interessant voor de amateur. So far in this series, we’ve covered the absolute basics of getting on the air as a radio amateur – getting licensed, and getting a transceiver. Both have been very low-cost exercises, at least in terms of wallet impact. Passing the test is only a matter of spending the time to study and perhaps shelling out a nominal fee, and a handy-talkie transceiver for the 2-meter and 70-centimeter ham bands can be had for well under $50. If you’re playing along at home, you haven’t really invested much yet. The total won’t go up much this week, if at all. This time we’re going to talk about what to actually do with your new privileges. The first step for most Technician-class amateur radio operators is checking out the local repeaters, most of which are set up exactly for the bands that Techs have access to. We’ll cover what exactly repeaters are, what they’re used for, and how to go about keying up for the first time to talk to your fellow hams. Time to face some cold, hard facts about amateur radio: that spiffy new Baofeng radio I recommended last time as a great starter radio is actually pretty lame. That fact has little to do with the mere $25 you spent on it, or $40 if you opted to upgrade the antenna. It’s a simple consequence of physics: a radio that transmits at 5 watts will only have so much range on the VHF band, and even less on UHF. Even if you buy a more powerful HT, or invest in a mobile or base-station rig running 50 or 100 watts, the plain fact is that direct radio-to-radio contacts on the same frequency, or simplex contacts, are difficult on VHF and UHF because those bands are really best for line of sight (LOS) use. That’s not to say that hams don’t use their VHF and UHF rigs for simplex communications, of course. Many hams like to see just how far they can push their signals on these bands, building big Yagi antennas and finding mountain peaks to operate from. But for general use around town, most hams rely on repeaters to extend the area they can communicate over. Repeaters are simply transceivers set up to receive signals on one frequency and transmit them on another at the same time, with the help of a device called a duplexer. This simultaneous reception and transmission gives rise to the term duplex communications, the general term for operating on a repeater. Repeater usually transmit at a much higher power than an HT or even a mobile rig can manage, and they usually have the advantage of being located on a mountaintop or some other elevated place to gain the furthest possible radio horizon as possible. This arrangement vastly increases the area that you can cover with your tiny HT. Depending on how the repeater is sited and what sort of antenna it has, you may be able to cover hundreds of square miles, as opposed to perhaps a few miles radius under ideal conditions, or a few blocks in the typical urban or suburban setting with lots of clutter from buildings and trees. What’s more, some repeaters are linked to other repeaters either through backhaul connections, often via the Internet but also sometimes through powerful LOS microwave links. In these systems it’s possible to use a puny HT to talk to another ham over hundreds or even thousands of miles. It’s actually pretty cool. So where are these repeaters, and how do you start working them? The first question is easy to answer: they’re everywhere. Look at any tall building, mountaintop antenna farm, or municipal water tank, and chances are pretty good there’s a ham repeater there. But being able to work them means you need to know exactly where they are, to be sure you’re in range of the repeater, or “the machine” as hams often refer to it, as well as the frequencies it operates on. The first thing you’ll notice is that several machines at different sites have the same callsign. 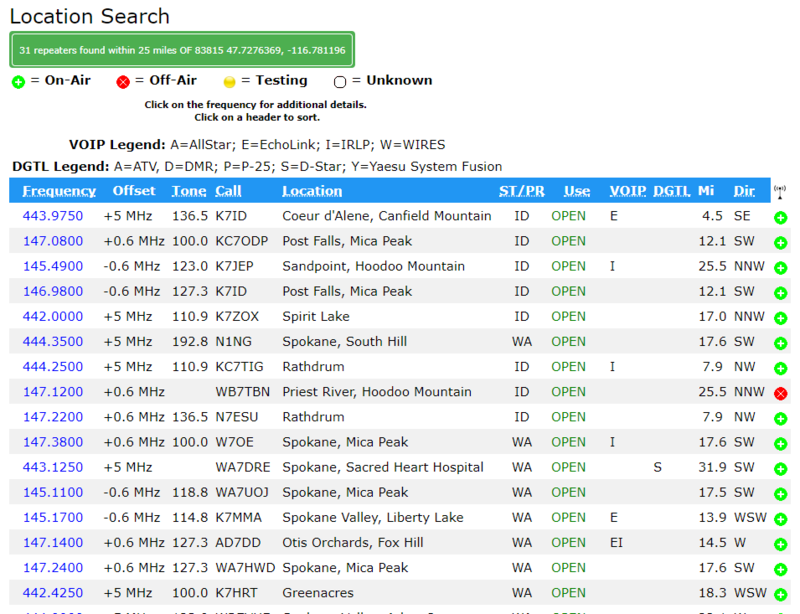 For example, K7ID runs a UHF repeater on Canfield Mountain and a VHF machine on Mica Peak. Both are LOS to me, and I can easily hit them with an HT. The frequency listed in the first column is the transmit frequency of the repeater. Your HT will need to be set to this frequency to hear what’s being said. Your radio will also need to be programmed for the correct tone, listed in the third column. That tone is an audio frequency signal known by a number of different trade names, but generically as continuous tone-coded squelch system (CTCSS). Your radio is capable of adding this sub-audible tone to your transmission; the repeater will only “open up” to transmissions that are correctly coded. Some repeaters have no tone coding, others have different tones for receive and transmit. When doubt, try to find out who runs the machine – most, but not all, are run by a ham radio club – and see if you can look up instructions on the web. The offset shown in the second column is perhaps the most important bit of information. Recall that repeaters transmit and receive on different frequencies, and that they’re listed by their transmit frequency. The offset tells you what the repeater’s input frequency is, which is the frequency your radio will need to be set to transmit on. For example, the machine I most often used is the K7ID machine on Mica Peak. It’s at 146.980 and shows an offset of -0.6 MHz. That means that my radio has to be set to 146.380 MHz transmission frequency. VHF repeaters are usually 0.6 MHz, but could be plus or minus depending on which part of the VHF band they’re in. UHF repeaters usually have +5 MHz offsets. Note: I’m not going to cover programming your radio, because there are plenty of guides online that do a better job than I can. DuckDuckGo is your friend. Once you’ve found your local repeaters and programmed your radio, it’s time to get on the air. My advice is to spend the first few days just listening to one or more repeaters. Activity levels vary – some machines are hopping all day, and some are barely used except during the typical commuting hours. When you hear a conversation, try to get a feeling for the culture of the repeater. Every group of hams has a culture, and as we discussed in the first installment of the series, it’s not always a healthy culture. My local repeater belongs to the Kootenai Amateur Radio Society, as friendly and as inviting a group of people as I’ve ever heard on the air. After listening to them chat for a few weeks, I was more than ready to reach out to them. But first, a word about kerchunking. If you want to know if you’re in range of a repeater, you can test it out. Most repeaters have a “squelch tail” that keeps the repeater on the air for several seconds before going back to sleep, and this can be used to check if you’re in range. Some repeaters even identify themselves, either with a synthesized voice or Morse code when they “wake up”. So you might want to ping the repeater. Kerchunking, or transmitting into a repeater without identifying yourself, is one of those bad habits that everyone seems to have. But FCC part 97 rules, which cover the amateur radio service, require operators to transmit their call sign when they start a transmission. So don’t kerchunk; a simple identification like “This is KC1DJT testing and clear” will suffice. Nobody is likely to take that as an invitation to chat, but they might give you a reception report. I’ve become a regular on this net and a few others, mainly because I want to practice, but also to get over my mic shyness. There’s another reason too – I want people to recognize my voice and callsign. If there ever is an emergency in my area, I feel like it’ll be easier to pitch in or to get help if I need it if people hear a familiar voice. Over the next few installments, we’re finally going to get to what I think ham radio is all about at its core: homebrewing. We’ll be building a few simple projects to make that cheap HT a little better, and also build a few tools to help run the shack a little more efficiently. There used to be a time when amateur radio was a fairly static pursuit. There was a lot of fascination to be had with building radios, but what you did with them remained constant year on year. Morse code was sent by hand with a key, voice was on FM or SSB with a few old-timers using AM, and you’d hear the warbling tones of RTTY traffic generated by mechanical teletypes. By contrast the radio amateur of today lives in a fast-paced world of ever-evolving digital modes, in which much of the excitement comes in pushing the boundaries of what is possible when a radio is connected to a computer. A new contender in one part of the hobby has come our way from [Guillaume, F4HDK], in the form of his NPR, or New Packet Radio mode. NPR is intended to bring high bandwidth IP networking to radio amateurs in the 70 cm band, and it does this rather cleverly with a modem that contains a single-chip FSK transceiver intended for use in licence-free ISM band applications. There is an Ethernet module and an Mbed microcontroller board on a custom PCB, which when assembled produces a few hundred milliwatts of RF that can be fed to an off-the-shelf DMR power amplifier. Each network is configured around a master node intended to use an omnidirectional antenna, to which individual nodes connect. Time-division multiplexing is enforced by the master so there should be no collisions, and this coupled with the relatively wide radio bandwidth of the ISM transceiver gives the system a high usable data bandwidth. Whether or not the mode is taken up and becomes a success depends upon the will of individual radio amateurs. But it does hold the interesting feature of relying upon relatively inexpensive parts, so the barrier to entry is lower than it might be otherwise. If you are wondering where you might have seen [F4HDK] before, we’ve previously brought you his FPGA computer. The new satellite, Es’hail-2, was built for Es’hailSat, a Qatari telecommunications concern. As satellites go, it’s a pretty standard machine, built primarily to provide direct digital TV service to the Middle East and Africa. But interestingly, it was designed from the start to carry an amateur radio payload. The request for proposals (RFP) that Es’hailSat sent to potential vendors in early 2014 specifically called for the inclusion of an amateur repeater, to be developed jointly by AMSAT, the Radio Amateur Satellite Corporation. The repeater aboard Es’hail-2 was developed as a joint effort between the Qatar Amateur Radio Society (QARS), Es’HailSat, and AMSAT-DL, the AMSAT group in Germany. The willingness of Es’HailSat to include an amateur radio payload on a commercial bird might be partially explained by the fact that the QARS chairman is His Excellency Abdullah bin Hamad Al Attiyah (A71AU), former Deputy Prime Minister of Qatar. The repeater was engineered with two main services in mind. The first is a narrowband transponder intended for phone (voice) contacts, continuous wave (CW) for Morse contacts, and some of the narrow bandwidth digital modes, like PSK-31. The other transponder is for wideband use, intended to test Digital Amateur Television (DATV). The wideband transponder can carry two simultaneous HD signals and a beacon broadcasting video content from QARS. Both transponders uplink on the portion of the 2.4-GHz reserved for hams, while downlinking on the 10.4-GHz band. Es’hail-2 was launched aboard a SpaceX Falcon 9 from Cape Canaveral on November 15, 2018. The satellite was boosted to a geosynchronous orbit in the crowded slot located at 26.5° East longitude, parking it directly above the Democratic Republic of Congo. After tests were completed, a ceremony inaugurating the satellite as “Qatar OSCAR-100”, or QO-100, was held on February 14, 2019, making it the 100th OSCAR satellite launched by amateurs. Sadly for hams in the Americas and most of eastern Asia, QO-100 is out of range. But for hams anywhere from coastal Brazil to Thailand, the satellite is visible 24 hours a day. The equipment to use it can be a bit daunting, if the experience of this amateur radio club in Norway is any indication. They used a 3-meter dish for the 2.4-GHz uplink, along with a string of homebrew hardware and a lot of determination to pull off their one contact so far, and this from a team used to bouncing signals off the Moon. Receiving signals from QO-100 is considerably easier. A dish in the 60-cm to 1-meter range will suffice, depending on location, with a decent LNB downconverter. Pretty much any SDR will do for a receiver. An alternative to assembling the hardware yourself — and the only way to get in on the fun for the two-thirds of the planet not covered by the satellite — would be to tune into one of the WebSDR ground stations that have been set up. The British Amateur Television Club and AMSAT-UK, located at the Goonhilly Earth Station, have set up an SDR for the narrowband transponder that you can control over the web. I used it to listen in on a number of contacts between hams the other night. It’s hard to overstate the importance of QO-100. It’s the first ham repeater in geosynchronous orbit, as well as the first DATV transponder in space. It’s quite an achievement, and the skills it will allow hams to develop as they work this bird will inform the design of the next generation of ham satellites. Hats off to everyone who was involved in getting QO-100 flying! The licensing of amateur radio stations in the United States goes all the way back to 1912. (I’m concentrating on US laws and customs regarding the amateur radio service simply because that’s where I live; please feel free to chip in on the comments section about differences in other countries.) Anyone who wants to operate on the bands reserved for the amateur radio service has to be licensed by the Federal Communication Commission. Unlicensed individuals are free – and encouraged – to listen in on the bands, but if you don’t have a license, you can’t transmit. And trust me, the local hams, with know-how, equipment, and all the time in the world, will find you, resulting in an unpleasant encounter with the FCC. There’s really no reason not to get a license anyway. This will be among the cheapest parts of a ham’s journey, and perhaps even free. To earn a license you’ll need to pass a written exam, but before taking the plunge you’ll need to know a little about the classes of amateur radio licenses, and the privileges they bestow. The current entry-level license class in the US is called Technician class; the old Novice class was eliminated in 2000, along with the Morse code requirement for all classes. Technicians have privileges to operate mainly on the upper frequencies, primarily on the 2-meter (144 MHz) and 70-cm (420 MHz) bands in phone mode, which means voice transmissions. Technicians also have access to small slices of the 10-meter band using data modes, and small sections of 15-, 40-, and 80-meters if they learn Morse or use a computer to send and receive it. This limits the Technician to mainly local communications, but there’s plenty to do and loads to learn on these bands. Even with all the limitations, a Technician license still offers access to a lot of spectrum and serves as the gateway to the next two classes, General and Extra. Everyone has to start with a Technician license, which requires passing a 35-question multiple choice examination. The exam is standardized with questions selected from a fixed pool, with topics ranging from knowing FCC Part 97 rules to basic electronics and RF theory. The exam is pretty easy, especially for anyone with a background in electronics. In fact, many complete newbies come to exam sessions after having run through enough online practice tests to see every possible pool question and pass the exam without understanding a thing about radios or electronics. There are lively debates over whether that’s a good thing or not – personally, I’m not a fan of it – but it is what it is; the Technician exam is dead easy. Your investment in a Technician license will be minimal, and mostly consists of the time it takes to study. Online practice tests – I recommend the tests on QRZ.com – are free to take as many times as you need to. Some ham clubs offer local classes aimed at helping you to prepare, and those generally charge only a nominal fee. There are even one-day intensive “ham cram” sessions where you’re guided through all the material and take the exam at the end of the day. Exam sessions are run by Volunteer Exam Coordinators (VECs) Volunteer Examiners (VEs), hams who have special training in administering and grading exams. They too charge only a nominal fee – I think I paid $15 – and may even waive the fee under certain circumstances. There are also occasional special events like the annual Field Day, where hams set up tents and booths in public places as an outreach to the public, where exams are often administered for free. Honestly, getting your Technician license is about as low impact as the amateur radio hobby gets. Once you can consistently pass practice tests online, the actual exam is a breeze. Exams are graded on the spot so you’ll know instantly how you did, and you can even take the next exam for no extra charge if you’re ready. Give it a shot even if you haven’t studied – I nearly passed my Extra exam going in cold after I aced my General. In the next installment I’ll start discussing what the newly minted Technician can do with his or her license. It may seem like a pipe dream to get on the air for less than $50, but it’s surprising what’s available these days, and you’ll find that fifty dollars can go a long way toward making your first contact. To get the necessary stability, it is important that everything is secured. The original build made sure the tube would not move during operation, although [Mirko’s] tube mounting looks more conventional but still quite secure. Loose coupling of the antenna also contributes to stability, and the tuning adjustments ought to have longer shafts to minimize hand capacitance near the tuning knob. Another builder [Karl Schwab] notes that only about 1/3 of the tuning range is usable, so a reduction gear on the capacitor would also be welcome. The tube acts as both an oscillator and mixer, so the receiver is a type of direct conversion receiver. The tube’s filament draws about 200 mA, so battery operation is feasible. According to [Burkhard] his build drifts less than 1 Hz per minute, which isn’t bad. As you can see in the video, it works well enough. The EF80, by the way, is essentially an EF50 with a different base — that tube helped win World War II. If you like to build everything, maybe you could try the same feat with a homemade tube. The Retevis RT40 is a licence-free digital two-way handheld radio with lots of unused potential! As is typical of a [W2AEW] video, there’s more than just theory. An Icom transmitter provides signals in the 40 meter band to demonstrate the real world case. There’s discussion about how to measure peak envelope power (PEP) and comparison to average power and other measurements, as well. Although the examples use a ham radio band, the concepts will apply to any radio frequency from DC to light. If you want to do similar measurements, you’d need a scope, a peak-reading watt meter, and a dummy load along with the transmitter. We enjoyed that he uses a scope probe as a pointer, but we can’t really explain why. If you are ambitious, you can build your own SSB transceiver. Another common way to modulate RF is FM and we’ve talked about it before, too.